Saints quarterback Drew Brees threw for 307 yards against the Falcons, surpassing Dan Marino's season record of 5,084 passing yards, set in 1984. 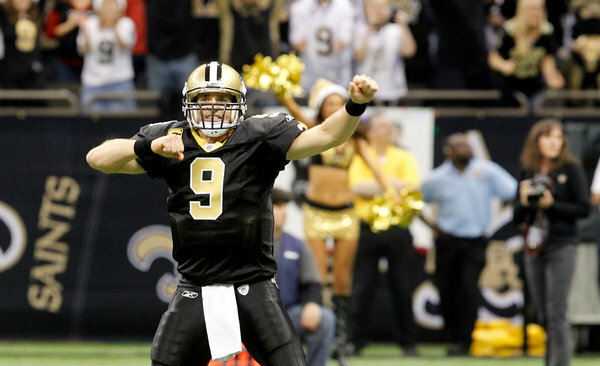 Drew Brees set the N.F.L. record for passing yards in a season Monday night, breaking a mark that Dan Marino had held for 27 years, and the New Orleans Saints clinched the N.F.C. South title with a 45-16 victory over the Atlanta Falcons at the Superdome. Brees had 307 yards and 4 touchdown passes, the last a 9-yard strike to Darren Sproles that set the record with 2 minutes 51 seconds remaining. It was Brees’s final pass of the game, and it gave him 5,087 yards this season — with one game still to play. As Sproles spiked the ball, Brees put his arm over his head and started walking toward midfield while the Superdome crowd went wild and his teammates chased him down. Brees’s four touchdown passes gave him 276 for his career, moving him ahead of Joe Montana (273) and Vinny Testaverde (275) for ninth all time. He is the first quarterback in N.F.L. history to pass for more than 5,000 yards twice; he had 5,069 in 2008, falling 15 short of Marino’s mark. Brees’s first scoring pass went for 8 yards to Marques Colston and the second for 9 yards to Jimmy Graham. In the third quarter, Brees hit Robert Meachem for a score from 24 yards, giving New Orleans a 28-10 lead. The Saints also had 463 total yards, giving them 6,857 for the season and breaking the 2008 club record of 6,571. New Orleans continues to close in on the league record of 7,075 offensive yards in a season, set by the 2000 St. Louis Rams. Brees might have broken the record in the third quarter if not for Sproles’s 92-yard kickoff return, which set up John Kasay’s 29-yard field goal. Brees also was intercepted twice, once in the Falcons end zone, but New Orleans was still dominant enough to take a comfortable lead. The game became a romp when Julio Jones was stripped by Scott Shanle and Malcolm Jenkins returned the ball 30 yards for a score to make it 38-16 in the fourth quarter. The Superdome crowd was in full celebration by then, but the play also meant fans would have to wait until later in the fourth quarter before Brees would get another chance to break Marino’s record. PETERSON MAY RETURN SOONER The Minnesota Vikings revised their timetable for running back Adrian Peterson’s recovery from left knee surgery, saying they think he will be ready to start the 2012 season. Peterson will have surgery in 7 to 10 days for torn anterior cruciate and medial collateral ligaments, said Eric Sugarman, the Vikings’ head trainer. JAGUARS LOSE TWO MORE Jacksonville placed cornerback Ashton Youboty (hamstring) and defensive end Matt Roth (concussion) on injured reserve, giving it a league-high 31 players on the list. TICKET PUSH IN CINCINNATI The Cincinnati Bengals made a buy-one, get-one-free offer to season-ticket holders for the final regular-season game Sunday in an effort to fill Paul Brown Stadium for a game against the Baltimore Ravens. Cincinnati (9-6) can clinch a wild-card playoff berth by beating Baltimore (11-4). The challenge is to fill the 65,500-seat stadium, which has been one-third empty for most games this season. A version of this article appeared in print on December 27, 2011, on page B11 of the New York edition with the headline: With Last Throw of Big Night, Brees Breaks Marino’s Mark.